Former DUP minister Jonathan Bell and a 'not-so-fairytale' of New York makes the front-page lead in three of Northern Ireland's newspapers. "Bell was so drunk he fell asleep in a US bar," reads the headline in the Belfast Telegraph. A second headline adds: "Minister sang at top of his voice when asked to leave pub, adviser tells RHI inquiry". 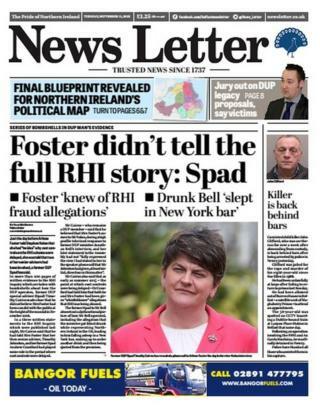 The Irish News leads with the headline: "'Drunk' Bell told to leave Big Apple bar, RHI inquiry told", while the News Letter turns the spotlight on DUP leader Arlene Foster and reports: "Foster didn't tell the full RHI story: Spad". The stories reflect the latest evidence given to the public inquiry into the botched Renewable Heat Incentive (RHI) inquiry by special adviser (spad) Timothy Carins. The RHI scheme was an initiative offering financial incentives to encourage businesses to switch to using renewable fuels to generate heat. But critical flaws meant that its claimants could earn substantial returns, far greater than intended. That came at the taxpayers' expense and the most recent estimate put the projected overspend at £700m over 20 years, up from an original figure of £490m. The News Letter reports that 200 pages of written evidence given to the inquiry are "laden with with bombshells about how the DUP operates". The paper's political editor writes that just the day before Mrs Foster told the BBC's Stephen Nolan that she had "no idea" why cost controls on the RHI scheme were delayed, she was told that two of her senior advisers had been involved, the former spad claimed. It reports that Mr Cairns made it clear that he did not believe Mrs Foster had been "candid with the public at the height of the scandal in December 2016". Inside the paper reports Mr Cairns' claims that Mr Bell had a "career-ending dossier on DUP private lives". Meanwhile, the Telegraph reports Mr Cairns' evidence that Jonathan Bell was so drunk in a US bar that he fell asleep and was asked to leave. He then broke into song, trilling Deep Blue Something hit, Breakfast at Tiffany's "at the top of his voice" and had to be helped back to his hotel, Mr Cairns said. Inside, the paper lists a series of what it calls "explosive allegations" contained in Mr Cairns' witness statement. These include a claim that Mr Bell was "compiling a dossier of what DUP members got up to in their private lives which he planned to present to party officers". The Irish News lists a series of allegations made by Mr Cairns who accuses Mr Bell of being "bullying and aggressive" towards him, other DUP members and civil servants. He also claimed DUP MP Emma Little-Pengelly and DUP MLA Michelle McIlveen were among those who experienced "bullying" and Mr Bell "rarely read his ministerial papers" and "often boasted" that he had only read the summary sheet. The Euromillions winner who sacked an assistant by text in a row over dirty dishes is the second lead in the Belfast Telegraph. Margaret Loughrey, who won £27m in December 2013, has been giving evidence to an industrial tribunal in a case of unfair dismissal taken by that assistant, Patrick Joseph Breslin, 34, from Strabane. She has said that she had given Mr Breslin a job, a place to live and taken him on an all-expenses-paid holiday to Egypt. He claimed his former employer had "put him through hell". The Mirror turns its attention to fears for people's jobs. "Debenhams in battle for survival," reads its front-page headlines. 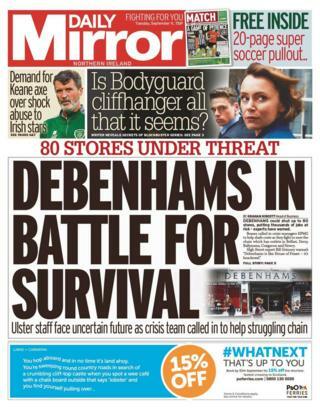 The paper says staff in Northern Ireland face an "uncertain future" with news that Debenhams could shut up to 80 stores. It says company bosses called in crisis managers KPMG to help cut costs as they fight to save the chain which has outlets in Belfast, Derry, Ballymena, Craigavon and Newry. The Mirror quotes "high street expert Bill Grimsey" who warns: "Debenhams is like House of Fraser - it's knackered". Inside the paper quotes football "heroes" saying it's time for Roy Keane to quit his role as assistant manager with the Republic of Ireland team. Liam Brady says Keane doesn't seem to like modern footballers: "This thing is boiling inside him. He's damaging a squad that's weak in many ways." Johnny Giles says: "If you talk about being equipped to be an assistant manager? Definitely not." The paper says both were speaking in a podcast for Eamon Dunphy's The Stand. The Mirror also features a story on new floating rubbish bins being used to clear up the north Down coastline. The sea bins cost £2,700 each. But they can collect up to half a ton of debris each year and could also collect oils and pollutants on the water surface. Never shy of a pun, the paper reports that the floating bins should keep the coastline nice and "tide-y".